I though I’d take a break from my fourth season of homesteading series to talk a little bit about root vegetables! I still have some left in my cellar so I thought I’d talk a little bit about what to do with root and other storage vegetables! Of course, the best way to keep most root vegetables fresh is to leave them in the ground as long as possible. However, in central New York snow gets deep fast so those vegetables have to come out of the ground before it gets too late! BEETS (Beta vulgaris): Store in cold part (32-38 degrees) of a root cellar unwashed. These need high humidity, so they should be covered in sawdust. These will store for about five months typically, although they will shrivel up pretty easily if the humidity drops too low. You can also store these in a sealed plastic bag in the crisper drawer of your refrigerator for a few weeks. CARROTS (Daucus carota sub. sativus): Store in cold part (32-38 degrees) of a root cellar unwashed. These need high humidity, so they should be covered in sawdust. These will store for about five to six months. You can also store these in a sealed plastic bag in the crisper drawer of your refrigerator for a few weeks. DAIKON RADISHES (Raphanus sativus): Store in cold part (32-38 degrees) of a root cellar unwashed. These need high humidity, so they should be covered in sawdust. These will store for about a month. You can also store these in a sealed plastic bag in the crisper drawer of your refrigerator for a few weeks. KOHLRABI (Brassica oleracea): Store in cold part (32-38 degrees) of a root cellar unwashed. These need high humidity, so they should be covered in sawdust. These will store for about two months typically, although I have kept the larger ones for much longer! ONIONS (Allium cepa): Store in cold part (32-38 degrees) of a root cellar unwashed and in a paper bag or other dry conditions. Do not store with potatoes. These will store for about five months or even longer. PARSNIPS (Pastinaca sativa): Store in cold part (32-38 degrees) of a root cellar washed and wrapped in plastic or wax paper. These could also be covered in sawdust or straw. These will store for about five to six months. You can also store these wrapped in the crisper drawer of your refrigerator for a few weeks. POTATOES (Solanum tuberosum): Store in dark areas above 50 degrees in paper or perforated plastic bags. These have lasted for up to six months for me. Do not store with onions. RUTABAGA (Brassica napobrassica): Store in cold part (32-38 degrees) of a root cellar unwashed. These need high humidity, so they should be covered in sawdust. These will last for quite a while – through spring if they are stored correctly. TURNIPS (Brassica rapa): Store in a root cellar unwashed. These need high humidity, so it’s best to store them covered in sawdust. You can also store these in a sealed plastic bag in the crisper drawer of your refrigerator for a few weeks. CABBAGE (Brassica oleracea): Store in cold part (32-38 degrees) of a root cellar unwashed. Wrap in plastic or other materials to keep moist. These will store for about five months. You can also wrap in plastic and store in refrigerator crisper for up to two months. WINTER SQUASH (Cucurbita spp. ): Store at about 50 degrees. It is best if they are separated from each other with paper or cloth. These will last anywhere from two months to six months, depending on the species and variety. What do you do with all of your root vegetables? Do you have any tips for keeping storage vegetables fresh longer? Interesting article! 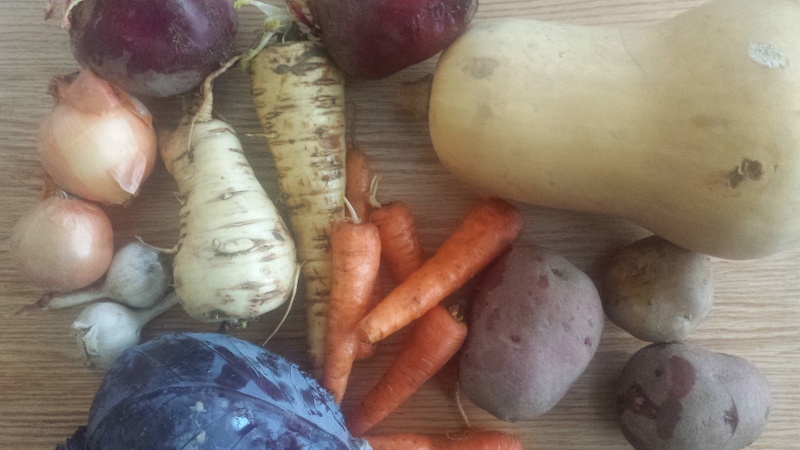 I haven’t tried storing root vegetables but it’s definitely on my “to do” list. I’ve been meaning to read up on how to do it, just haven’t it yet. So glad to find your article, will book mark it so I can refer back to it. I’m so glad you found this helpful! Thanks for visiting! This is a really helpful list you’ve put together. I didn’t realize root vegetables could last this long. I’m glad you found it helpful! Root vegetables are pretty great!